In this episode I interview Elizabeth Saunders. Elizabeth is a time coach, author, speaker, and founder/CEO of Real Life E. She has “been seen on” Mashable, NBC, Inc, and Forbes, just to name a few but click here for a more thorough list of her press coverage and awards and be prepared to be blown away. I first met Elizabeth when I was a vendor at a conference put on by our local state college. Elizabeth was one of the featured speakers and she made a tremendous impact on me that day both with her presentation as well as her humility. You’ll hear more about both in the interview. I encourage you to sign up for her free newsletter, like, “right now!” She doesn’t swarm your inbox with junk. I find that I look forward to each email because they contain such valuable insights on how I can choose the right way to investment my time in my life. You’ll want to check these links out. If you are working with a team or group, you will definitely want to check out her Time Investment Book page because there is a free download for a Group Study Guide. If you do decide to purchase her book and want to support the Networker for Business Women effort, I would so appreciate you purchasing it through my link below as I have an affiliate relationship with Amazon and Amazon will send me a one-time small commission. Regardless of whether or not you purchase it through my link, please do purchase it, it’s worth every single penny. I’m going through the book myself right now. Because of the book, I have already cleared my schedule of some commitments that, while very worthwhile, do not fit where I need to be focusing my attention right now. 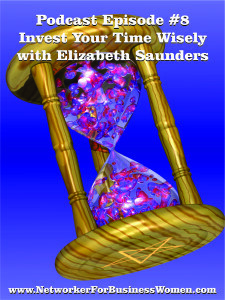 I’d love to hear about how YOU deal with how you invest your time! Let’s learn from one another. Just comment below! I am SO THRILLED to see that you are keeping up with the production of your show! Contrats on making it past episode 007! A comment on my blog from THE PODCAST ANSWER MAN…well…wow. Thanks, Cliff, could not have done it without YOU! Coming from Speyside, It’s refreshing to experience aNice Site. Good information. Will recommend you to my facebook group if you want. Keep up the Great Work. Hey thanks so much for the kudos!